You are here: Home / Aging Articles / In Case of Emergency – Protect Your Pet! As responsible adults, we try to plan for life’s unexpected events. We purchase all kinds of insurance, many of us even have pet insurance. Why? Because we want to want to make sure that if the unforeseen happens either those we leave behind are financially solvent or that we have the resources to recover. In fact, it’s become common practice to to bring some form of personal identification on us when we leave the house, even if we are out on a jog! My guess is, that the majority of us either have an ICE “in case of emergency” card in our wallet or smart phones. If you don’t, you certainly should. But what about our pets? Do you have a pet protection plan in place if you are involved in an accident or even die unexpectedly? The The Washington Post published an article based from the most current census stating “the proportion of Americans who live alone has grown steadily since the 1920s, increasing from roughly 5 percent then to 27 percent in 2013”. This number will only escalate. 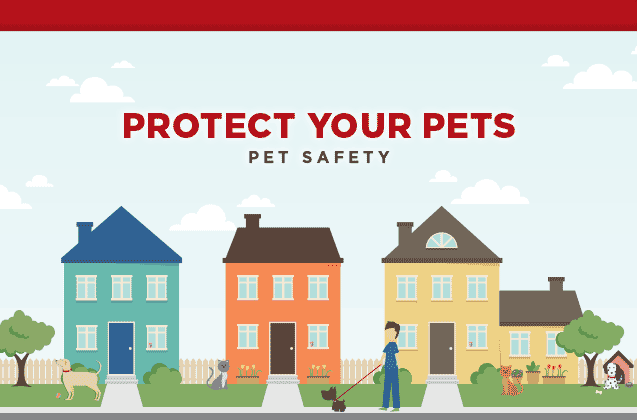 Combine that with the fact that “approximately 37-47% of all households in the United States have a dog, and 30-37% have a cat.” (Source: APPA), means that there is a large likely hood of someone’s pet will be left unattended too in the event of an emergency. 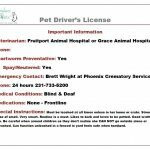 As pet parents, we owe it to furry, feathered or reptile children to add our pets’ information to our “ICE” and/or carry a separate pet alert identification card in our wallet AND in our vehicle’s glove compartment. Why? If you are in a situation where you are unable to speak for yourself, the authorities when looking for your personal identification will not only find your personal information, they will be alerted that there are pets in the home that will need to be cared for. This one simple act, has been known to save pets lives! There are many pet stores and events that offer this type of card, however they are simple to make. For those of you who are do-it-yourselfers, below is a recommendation on how to make a pet alert card. Please note, that if you have multiple pets, make one for each pet. Many pet parents have shared that they carry their pet’s alert data in all three locations, their smart phone’s ICE, wallet and in an envelope that is clearly labeled “In Case of Emergency” in their glove compartment. In closing – when planning for life’s unexpected events, if you are a pet parent, please remember to include your pet! This is a good reminder for me to make one for my wallet and his carrier. I’ve been thinking about getting one of these cards. I do have a husband and we have family and friends who know we have pets but I like that it adds an extra level of safety! Great advice. I also have a card in my wallet that if I ever get into an accident it notes that I have pets at home and who to contact. Our pets have go-bags! Thanks for sharing this important tip. I need to make one of these cards for Ted. Thank you for this important reminder. I have been meaning to add this ICE information to my phone. I just finished adding it along with my dog’s information. These cards are so important – and it’s great that you shared this with all of us! We have had friends that have had to rely on this: their doggy day care left on the day they were expected back from a trip, yet their plane was delayed. They had to call a neighbor to come and take care of their kids and luckily left these type of cards behind on the counter! Pet protection plans are a great idea, particularly for people who live alone. Thanks for an informative post. Wonderful post! My humans need to get a pet ID card in their wallets in case something would happen to them. Love the example card you shared. 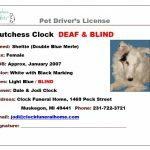 Love the idea of dog driver license. Gotta get one this. Great reminder. You just never know and better to be prepared. Goodness thanks for this fab reminder. And as we get into wicked weather, even more reason to share. This is such a great idea. I think you should create a little downloadable pdf for this so that people can print it out and stick it in their wallets! This is so important! I have a pet alert card in the front window but not in my wallet – I will make this a priority this week. I have never thought of making a card for my pets before. I should do this. Great info. Thanks for sharing. I need one of these. I love this idea and saved for my future reference and for others view! Excellent advice! I’m going to make one up for myself today. Thank you.